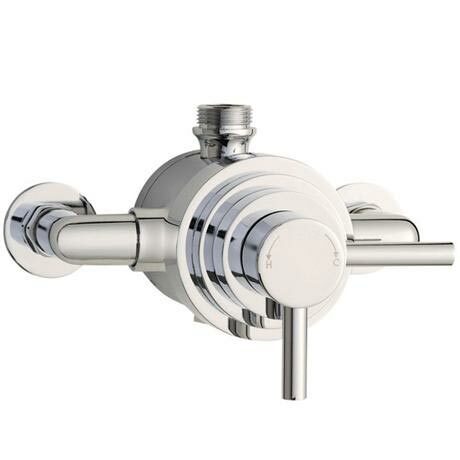 The Series F II Dual Exposed Thermostatic Shower Valve brings substantial elegance to the modern bathroom. This Exposed Thermostatic Dual Shower Valve offers thermostatic showering with two easy to operate levers, one lever operates flow control whilst the other allows temperature selection. Suitable for all types of plumbing installation this shower valve has the added safety benefit of a built in anti scald device should the cold water supply fail. Series F II shower valves will not only look outstanding in your new shower enclosure but will keep you and your family safe. Hi peter, no, the pipe work also gives the unit a fixing point to the wall to secure the product. Thanks!